This area of Kent has more history than anywhere else on Earth, that’s the belief of George Chittenden and Peter Fishlock, the Deal locals who created The History Project. Whether you agree with them or not, you can't help but admire their enthusiasm and love for their town. The project has built up a significant online following, posting videos and articles they produce themselves. They hold regular nights at The Astor Theatre, pay visits to schools and hold talks for community groups. You might have seen their bright yellow gazebo on Deal seafront. 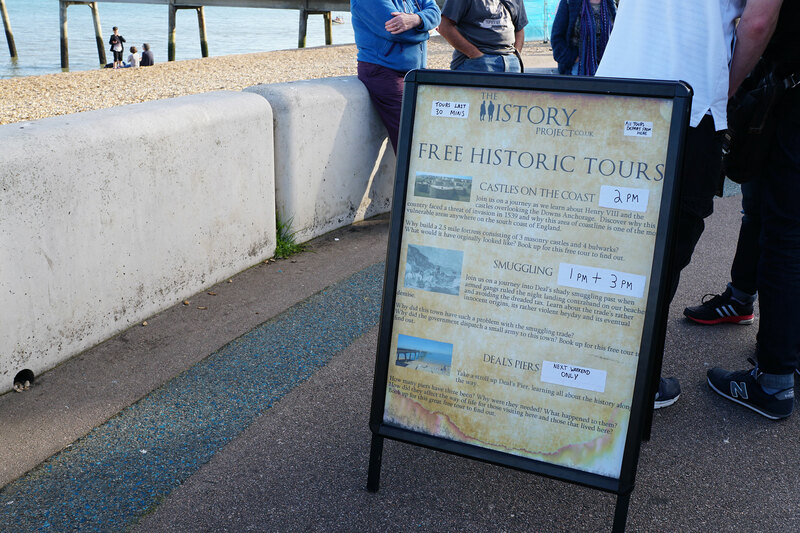 From Friday to Sunday the hold walking tours educating locals and visitors about Deal’s past. There's a few to choose from each day and they last for around 30 minutes. The tours are free, you can support the project by giving a donation at the end or by pledging on their website. We did our best to write down some of the interesting facts we learned but if you’re interested in knowing more we’d highly recommend going along to one of their tours at the weekend. 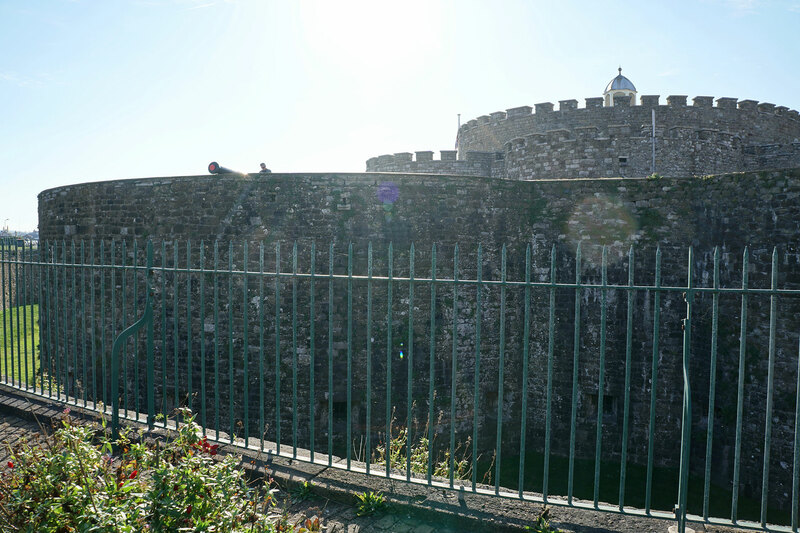 On Saturday, we joined George as he took us on the Castles on the Coast tour, followed by a walk around the conservation area to learn about Smuggling. 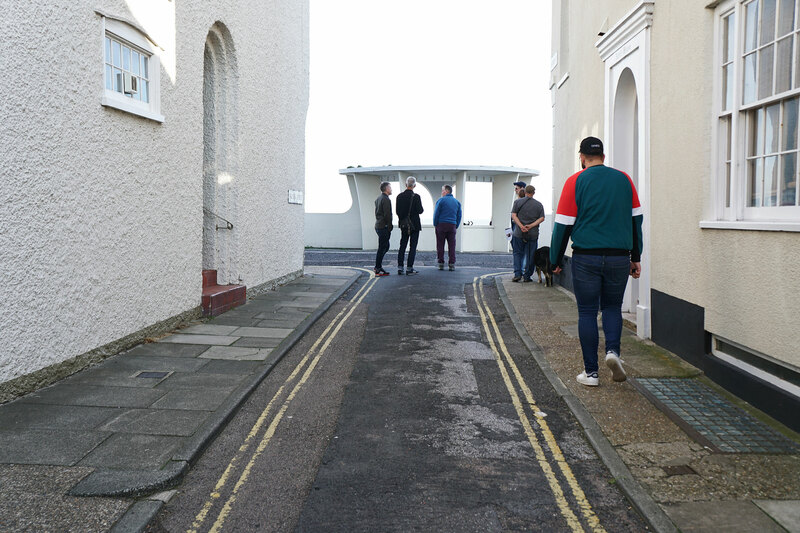 They all begin from a pitch opposite Deal Beach Parlour and take you up to Deal Castle or through to Middle Street. We learned a lot about the smuggling trade in Deal and why it became such a large scale industry here, and how William Pitt the younger combatted it. The castle tour explained why Henry VIII built Sandown Deal and Walmer Castles here and the measures that were taken to sure up this vulnerable stretch of coastline. Deal Castle is a round shape as engineers found that the tall square shapes of Norman keeps (like the one at Dover castle) were easy to bring down as they are weak at the corners. However, a circular shape would be able to deflect cannon fire much more effectively. They also feared that a lime mortar would corrode easily from the salt in the sea air. So flint was added to the mortar to better protect the building. It's also a short structure so that ships wouldn't be able to spot the fortress until it was too late. Something we never questioned, but makes a lot of sense when you think about it. In 1952 a ship carrying mahogany logs hit the Goodwin Sands. Before it sank much of its cargo was rescued. However, a mahogany log was recently washed up on Kingsdown beach. It weighs eight tonnes and could easily sink a ferry. Local fishermen used their winches to drag it in and the log can be seen on Deal seafront near the fishing boats. We had never noticed the massive trunk before, despite walking past it several times per week. One of the reasons smuggling was so rife in Deal is the shingle beach, boats could easily land on the beach. The hull of the boat would be supported by the stones, unlike on a sandy beach. The tide could then carry the boat back out to sea again when it came in. The Crown had fewer resources than the smugglers, who would use violence and blackmail to escape prosecution from revenue men- sometimes threatening their families. They also forced local pubs and inns to sell their smuggled alcohol. Deal is said to have 365 pubs, and people sold alcohol from their own homes. Deal a prospered in wartime when the navy and merchants would come to shore at Deal, needing provisions and places to stay. Napoleon encouraged trade with English smugglers as he knew how badly it affected the economy. Information was also traded to the French as smugglers tipped them off in return for bribes. William Pitt made a stand against the smugglers and introduced a series of taxes. One called the window tax. 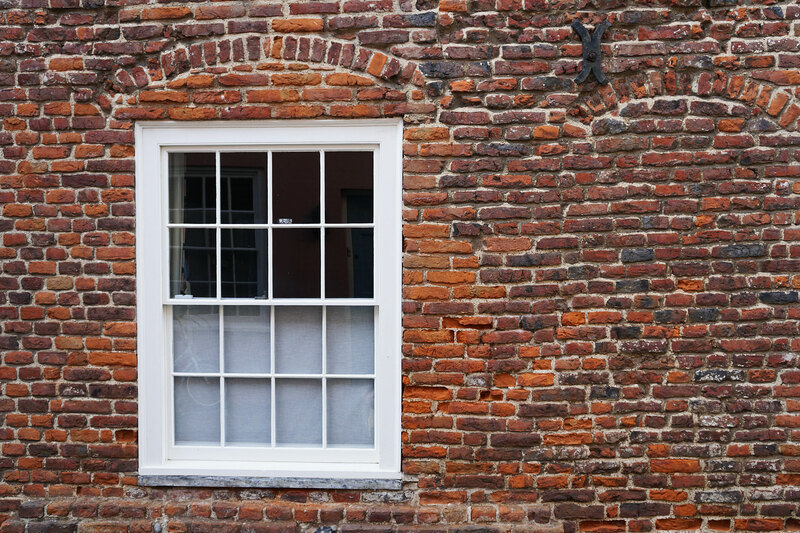 People started bricking up their windows to avoid the tax. This can be seen along Middle Street. This is where the phrase daylight robbery came from. Pitt also sent 900 soldiers to Deal to extract a £10,000 worth of contraband. He then set fire to every seaworthy vessel in Deal. Which had little effect on the smugglers who were able to be back up and running again pretty soon. But the fishermen were hit hard and suffered greatly. The tours were engaging, with lots of opportunities to ask questions. We liked how George spoke about national history, and explained the impact it had on people here in Deal. We felt like we’d come away having learned a lot in a short space of time. It's fun to do something different like this every now and then. It just goes to show what a great town Deal is, full of little eccentricities we don't always notice every day. Highly recommended if you’d like to find out more about the town, or have an interest in history. It makes you appreciate how lucky we are to live somewhere with such a rich past.